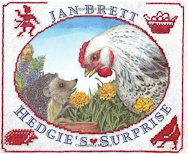 Jan Brett’s beloved character Hedgie stars in this charming story about a little Tomten who gets tired of porridge for breakfast and starts stealing Henny’s eggs. But Henny wants a brood of chicks and she needs her eggs. With the help of clever Hedgie, she substitutes an acorn, a strawberry, a mushroom and finally a potato in her nest. But nothing stops that Tomten until the little hedgehog hides in Henny’s nest: when the Tomten reaches in to get his morning treat, all he gets is a handful of prickles. He runs home for porridge and never comes back again! Intricate needlepoint patterns of Scandinavian designs frame the characters reacting from the borders in this beautiful picture book set in Denmark.